Like CORE Organic Drinks? We found a smoking hot deal on Amazon! 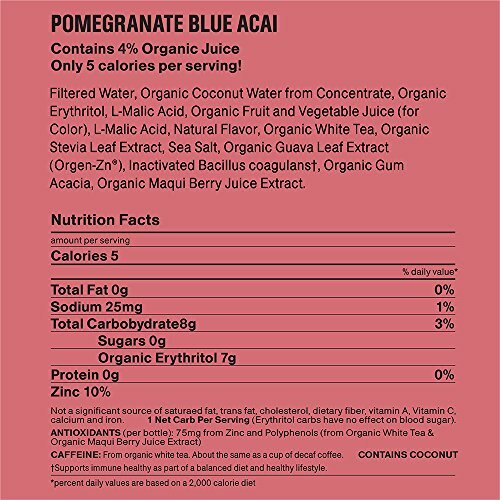 Hurry and get the CORE Organic, Pomegranate Blue Acai, 18 Fl Oz (Pack of 12), Fruit Infused Beverage, Vegan/Gluten-Free, Non-GMO, Refreshing Flavored Water with Antioxidants, Great For Immunity Support today for as low as $7.13 from Amazon when you clip the 25% of coupon & choose Subscribe & Save with at least 5 subscriptions in one month. That’s just $.59 per drink!! WHOA! Compare to $2.18 each at Walmart, 2/$4.00 at Kroger or $2.49 at Giant Eagle. This product has many variations at different prices! Quickly see them all here. Check out all of the Amazon deals here! Want it sooner? Choose one-time purchase, clip the coupon & pay $8.91 ($.74/drink). Amazon Prime members get FREE 2-day shipping!! If you are not a Prime member, get FREE shipping when you purchase $25 or more of eligible items across any product category. NATURALLY SWEET, LOW CALORIE: A unique blend of USDA-certified organic sweeteners derived from plants in our delicious 5-calorie per serving fruit hydration. Low glycemic index, with less than 1 gram of sugar per serving…. now that’s sweet! NEW LEVEL OF ORGANIC WATER: If you enjoy fruit-flavored water from Hint, Bai, Izze, Odwalla, Hfactor, Martinelli’s, WANU, Propel, Stir Drinks, Life Wtr, Noka, Protein2o, Taste Nirvana, Just Water, or hellowater – Try CORE Organic fruit-infused water. CORE Organic is big on taste and low on guilt. USDA certified organic with only 5 calories and less than 1g of sugar per serving with antioxidants. USDA Organic products are highly regulated leading to cleaner labels vs. “natural” and conventional products which can contain artificial pesticides, fertilizers, GMOs and other artificial ingredients. Drinking and eating organic is a way to help assure yourself that you are not ingesting harmful ingredients. No need to give up on taste or give into high calories or sugar CORE Organic is only 5 calories per serving and still has amazing flavor. CORE has a unique blend of USDA Certified Organic sweeteners (Organic Stevia Leaf Extract and Organic Erythritol) that are found in nature and don’t leave the aftertaste often found with non-organic blends. CORE Organic products are less than 1g of sugar per serving and low glycemic. A product that is low glycemic has a low impact on your blood sugar level. Having high blood sugar can lead to numerous health issues. Antioxidants – Antioxidants can help protect the body from damage caused by harmful molecules in the body called free radicals. No Artificial Sweeteners – Organic Stevia Leaf Extract and Organic Erythritol which are found in nature make up our unique blend of sweetness. Low Glycemic – With less than 1g of sugar for those watching sugar intake. Buy the CORE Organic, Pomegranate Blue Acai, 18 Fl Oz (Pack of 12), Fruit Infused Beverage, Vegan/Gluten-Free, Non-GMO, Refreshing Flavored Water with Antioxidants, Great For Immunity Support from Amazon. Previous articleFlush Force, Series 2, Bizarre Bathtub with 8-Pack Figures DEAL!